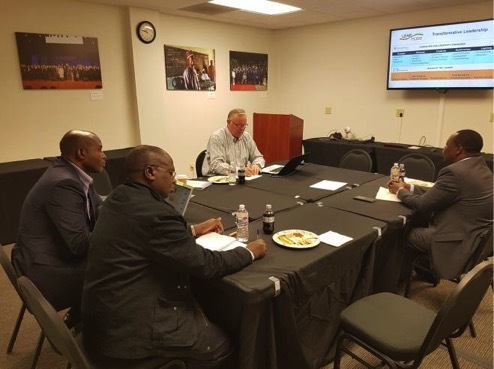 Global Peace Foundation (GPF) hosted senior Kenyan Ministry of Education officials in Seattle, Washington on June 26 to explore collaborative steps in enhancing character education coupled with STEM (Science, Technology, Engineering, Mathematics) proficiencies in Kenya’s high schools. The prominent assembly embarked on a field tour of the Microsoft campus and some of the best educational institutions in the United States and concluded with a consultation with heads of Global Peace Education (GPE) and Microsoft’s Worldwide Education department at GPF’s Seattle office. Officials included the Director of Tertiary and Secondary Education Mr. Robert Masese, the Director of the Centre for Mathematics, Science and Technology Education in Africa (CEMASTEA), Mr. Stephen Njoroge, and the Executive Director of GPF Kenya, Mr. Daniel Juma Omondi. Together, delegates toured Tesla STEM High School, a top STEM school in the US where academic concepts are coupled with real world problems and the application of science, technology, engineering and mathematics is placed in context with problem-based learning. 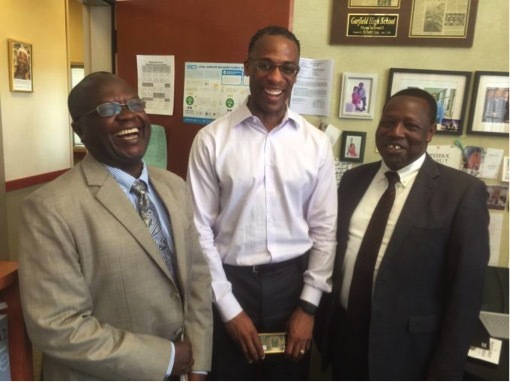 The team also visited Garfield High School, known for instituting one of the best school management cultures through restorative conflict resolution, recognizing and rewarding positive student behaviors, and strengthening ties between parents and the community. Garfield implements Dialogue Circles to support classroom management, building collaboration, respect, and positive behavior among students. The tours culminated in an exploration of GPE's Character and Creativity Initiative, an innovative system integrated into schools to advance students' problem-solving skills, communication, collaboration, and sense of purpose, respect and resilience to succeed in the modern world. "The CCI program spearheaded by GPF advocates for a transformed school culture and addresses the morals and values of students. Through this program, a transformed school will have an inviting climate that students appreciate, and will always yearn to stay in school." Director of Worldwide Education at Microsoft Campus, Mr. Jeff Johnson, and the Vice President of GPF and head of Global Peace Education, Dr. Tony Devine, met with the Kenyan officials in Seattle to begin exploring action steps in applying CCI, Leap hubs, Moral and Innovative Leadership, Work force Development through Technology & Digital learning and peace-making in Schools into Kenyan STEM hub schools. Pointing out a severe issue in violence-prone areas of Kenya, Mr. Njoroge emphasized the need to create an inviting school climate that encourages students to appreciate the value of schools. “When students are burning schools, it is a clear indicator that they do not acknowledge the value of schools. The CCI program spearheaded by GPF advocates for a transformed school culture and addresses the morals and values of students. Through this program, a transformed school will have an inviting climate that students appreciate, and will always yearn to stay in school,” he reiterated. In order to encourage more students to pursue STEM careers, Kenya’s Ministry of Education has established STEM Hubs in 94 high schools, split evenly between all-boy and all-girl schools. Initiated in September 2016, the remaining schools were officially launched on July 14, 2017 by the Cabinet Secretary for Education, Dr. Fred Matiang’I, a ceremony at which CEMASTEA announced the partnership with Global Peace Foundation to enhance national values, character and creativity in all 94 STEM schools. GPF will contribute to the STEM Hubs by offering training to the top 20% of teachers showing transformative and pedagogical aptitude, offering expertise on Moral and Innovative Leadership and Management best practices. GPF will also partner with CEMASTEA and the Ministry of Education to organize an annual Education Innovation Summit, providing a platform for transformative education stakeholders to showcase best practices in the management of education in Kenya and the region. Learn more about the Character and Creativity Initiative transforming school culture around the world.